Vote forTownsville, QLDTop Major Destinations Which are Australia's must-visit destinations? You help us decide. QLD's Townsville and its neighbouring Magnetic Island remain something of a hidden gem in terms of Australian travel. They allow visitors to experience the best of a destination that combines both history and a stunning reef environment into a single, enjoyable package. Located on the tropical QLD coast with universally warm weather, it's a destination that is generally far less crowded than some of the similar yet more commercial destinations. Visit Townsville and Magnetic Island to grab a slice of heaven all for yourself. Townsville is a city that has seen continued growth in recent times to far more than its origins as a mining-oriented town. The physical beauty of the region soon became widely apparent, and as a result, tourism is now a big part of its economy. It's no wonder that both transient workers and visitors alike came to see the value in the region as much more than simply a place to earn a living; Townsville's position between Mackay and other QLD travel hotspot Cairns is not only convenient, it also offers the chance to take part in a great balance of experiences on both land and sea. Perhaps Townsville's most obvious differentiating feature is lovely Magnetic Island, which lies just a short distance off the coast of the city. The island's location not only provides quick, easy access from the mainland but also serves as a wonderful natural decoration that adds to the charm of the city's coastal views. This oasis is popular with locals and visitors alike and takes a mere 20-minute boat ride to access. It offers a mixture of pristine beaches, hidden bays, abundant wildlife and a myriad of walking tracks in return for the small amount of effort. Central Townsville geological icon Castle Hill – which sits almost dead-centre in the heart of the city – is another mainstay, which serves as both a natural barrier breaking up the monotony of the cityscape as well as an ever-popular lookout point to take in the city's best views. Visitors can choose to either climb or drive up the hill; either way you'll be treated to impressive views of the city and its surrounds - especially at sunrise and sunset. Townsville's location also offers a great deal of flexibility in accessing surrounding areas of stark contrast – with variety on offer in every direction, it's possible for visitors to the city to “check off” essential must-do items such as the Aussie Outback, Great Barrier Reef, and tropical rainforest all in a single trip. Add to all of this the generally warm and friendly attitudes of the locals – the increasingly large city still manages to retain a “small town” feel in its disposition – and you've got a mix of variety, warmth and overall outdoor enjoyment just waiting to be visited. Few other places in Australia offer this balanced mix in an environment that also feels far less commercialised and “touristy” overall than several other similar Tropical North QLD destinations; if you've never considered Townsville for a trip before, there's no better time to do so than the present. Looking to pay a visit to Townsville but not sure what to do? Here are some of its most essential experiences. What's new in Townsville in 2016/2017? City Lane, Townsville's new Laneway Dining Precinct, has brought the city's dining scene to life with a bevvy of dining options. Tiger Air launched routes in Townsville this year, with direct Melbourne to Townsville flights making for an ideal Victoria-to-QLD winter getaway. Lots of new events including Rugby League World Cup, Basketball games as part of Commonwealth Games for sporting enthusiasts. Need more info on Townsville? Check out our detailed travel features on this top spot below. Townsville offers a solid balance between experiences that are both natural and man-made, with a wide range of ages catered for, too. We highlight ten essential Townsville experiences here. Visiting Townsville with the kids in tow? No worries - we take a look at some of the best attractions and activities for keeping children entertained in Townsville and surrounds in detail here. As it continues to grow, so does Townsville's culinary scene become more and more refined. We take a look at some of the top quality dining options in the tropical QLD city in detail here. 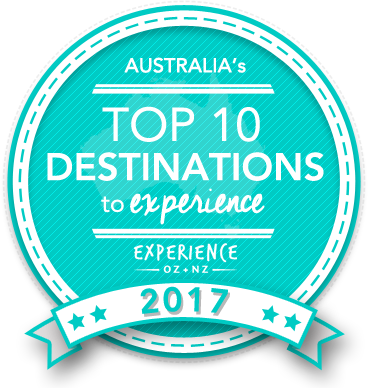 Is Townsville Australia's Top Major Destination to Experience for 2017? Vote now for the chance to WIN an epic trip to one of Australia's top destinations!